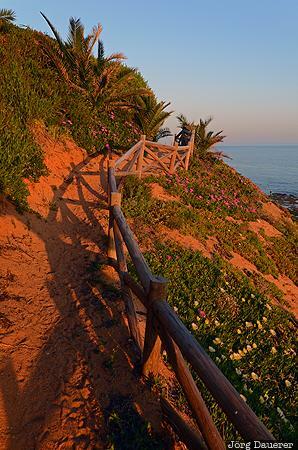 A narrow coastal path at the Atlantic coast near Olhos de Água with a wooden fence illuminated by warm evening light. Olhos de Água is near Faro in the Algarve in southern Portugal. This photo was taken in the evening of a sunny day in March of 2011. This photo was taken with a digital camera.